Looking for a way to unwind for the evening? Lavender Mint Dream is a relaxing way to end the day. This completely herbal tisane contains no caffeine. 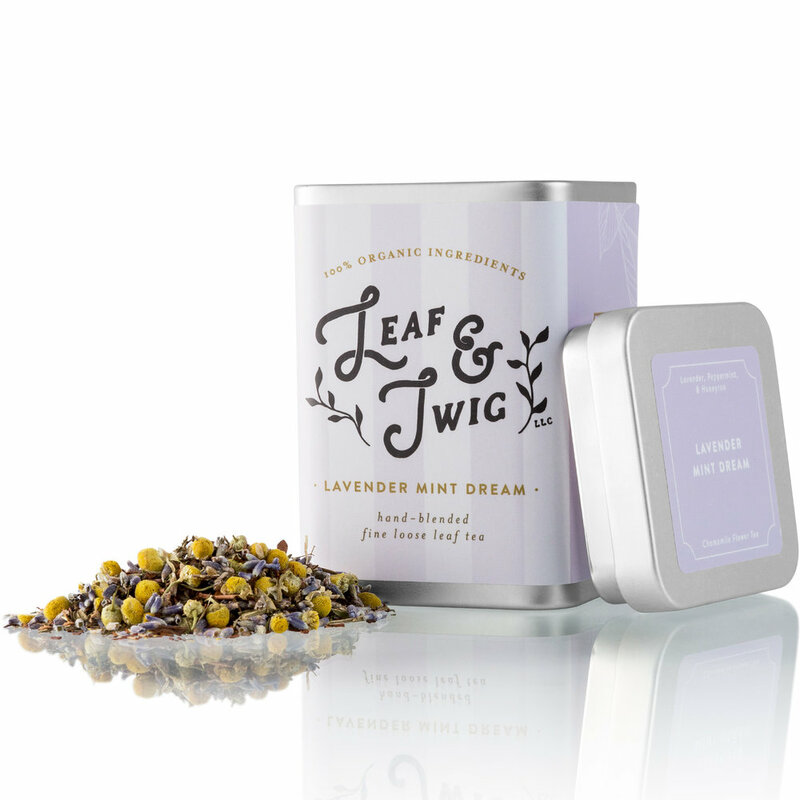 It’s a calming blend of Peppermint, Lavender, Chamomile, and Honeyroo, which is a blend of rooibos and honeybush. We like Honeyroo as it softens the flavor of rooibos and allows the other herbs to really shine. Large Tin - $13.50 | 18 Servings | 2.5 oz. Small Tin - $5.50 | 4 Servings | 0.6 oz. NEW! Bulk 1lb Bag - $40.50 | 63 Servings | 8.75 oz. Lavender is a bushy, branching shrub about 3’ tall. While it is native to the Mediterranean area, we have been able to grow it in Southwestern PA. The plant flowers starting from end of June. Lavender is used in herbals to support the body against headaches, mild anxiety, insomnia, fatigue, mild depression, and minor digestive problems. 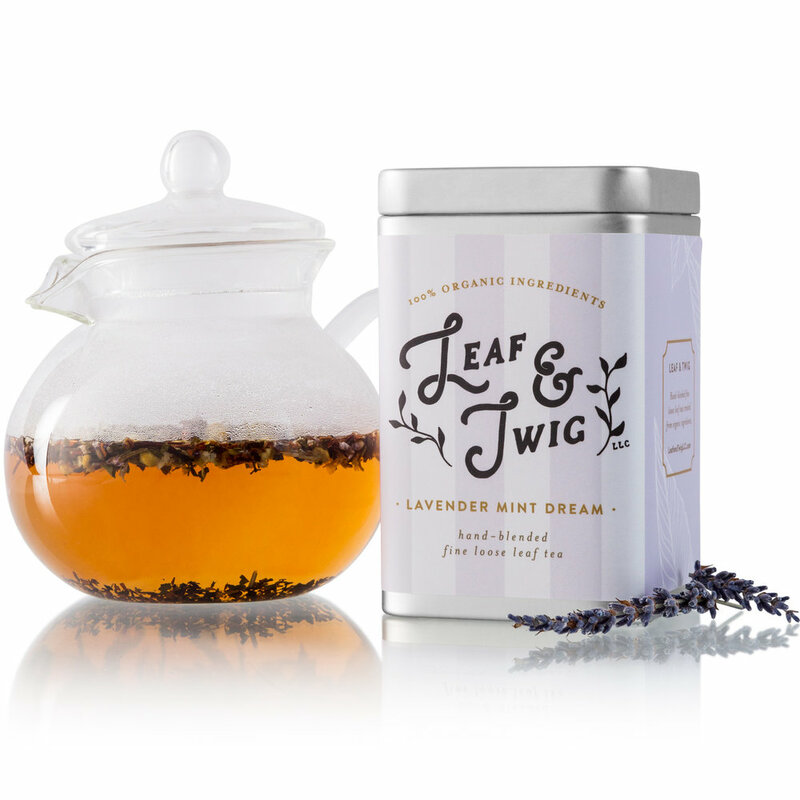 When using lavender for sleep, it is best to drink the tisane an hour before bedtime. Contraindications (times when Lavender is not recommended): Avoid high doses of lavender when pregnant as it can be a uterine stimulant. Peppermint is wonderful for helping muscles relax. It can also be good for headaches. We are using it here for its fresh taste and for its benefits in helping you unwind from the day. We use German Chamomile in our Lavender Mint Dream tisane. It is native to Europe, Eastern Europe, North Africa, and parts of Asia. The plant reaches to 3 feet although some wild varieties are low growing. Chamomile is often used to calm nervous tension in the stomach, anxiety, insomnia, menstrual disorders, and Crohn’s disease. It is known for causing drowsiness for many people. Contraindications: Avoid if you have asthma or are allergic to asters, daisies, chrysanthemums, or ragweed. Avoid if pregnant. Chamomile may interact with medications. If you have questions about herb-drug interactions, contact your physician. This tea is a blend of rooibos and honeybush. We like Honeyroo as it softens the flavor of rooibos and allows the other herbs to really shine.